Located at 1901 South Ocean Blvd., the project will be located on the land currently occupied by the Wright by the Sea Hotel. The hotel will be demolished at the end of April and construction will begin on Ocean Delray immediately thereafter. A rendering of the Ocean Delray project. DELRAY BEACH, FL—After securing final site plan approval earlier this week, National Realty Advisors of Secaucus, NJ and US Construction of Philadelphia, co-developers of Ocean Delray, say that construction on the ultra-luxury condo development will begin in late April. 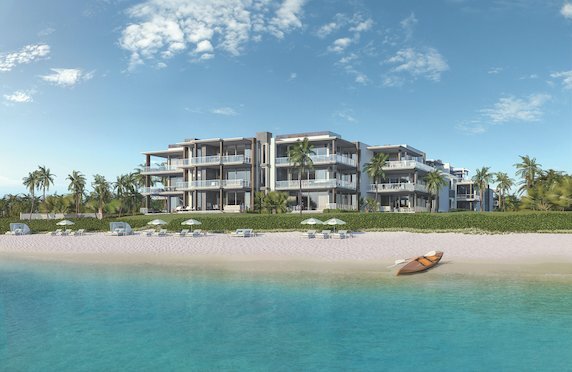 On Tuesday, March 12th, city commissioners granted final site plan approval for the 19-unit condo project, which the developers say will be the first ever ultra-luxury, oceanfront residential development in Delray Beach. In fact, it has been more than 30 years since any type of development has taken place on the ocean in Delray Beach. Located at 1901 South Ocean Blvd., the project will be located on the land currently occupied by the Wright by the Sea Hotel. The hotel will be demolished at the end of April and construction will begin on Ocean Delray immediately thereafter, the developers state. Completion of the project that will feature units priced from the high- $4 million to $9 million range is projected for the fourth quarter of 2020. The development teams notes that the 1.8-acre project site features more than 200 feet of ocean frontage and some of the widest seagrass dune lines in South Florida. Replacing the former hotel will be a single, three-level residential building designed by South Florida architect Randall Stofft, who designed the distinctive Seagate Hotel & Residences. “Ocean Delray is what people have been waiting for: ultra-luxury living with direct oceanfront access. These are world-class residences, and no detail will be missed in our one-of-a-kind development,” says Glenn La Mattina, SVP of development at NRIA. The 19 highly-appointed, three to five-bedroom residences will range from 3,373 square feet to more than 4,400 square feet. The three-bedroom plus den to five-bedroom residences, complete with 4.5 to 6.5 bathrooms, offer expansive oceanfront terraces that add from 682 square feet to more than 2,300 square feet of additional living area with glass panel balcony railings. Each residence will have a private, enclosed and air-conditioned garage with electric car charging units. The development will also feature climate-controlled golf cart parking and storage facilities. Private elevators will take residents from their individual garage to their beachfront home.